The Dorsey Brothers’ recorded this tune for Decca (115) on August 15, 1934 and for Columbia (36065) on September 24. Their Decca recording was the first to make the charts peaking at number 20. The scrappy Dorsey Brothers, trombonist and sometime trumpeter Tommy and master-of-all-the-reeds Jimmy, began their careers working in bands together in their native Pennsylvania, and the association continued when they moved to New York in 1925. After almost a decade of freelance work in the recording studios and on radio (sometimes working as the Dorsey Brothers Orchestra), the two formed their own fulltime orchestra in 1934. When the pair formed their ensemble, they needed a theme song-a tune to introduce the band on radio broadcasts. They picked “I’m Getting Sentimental over You.” In mid-1935, during a performance, Tommy was kicking a tune off when Jimmy piped in “Hey Mac (Tommy’s nickname), isn’t that a little fast?” It was the “straw that broke the camel’s back.” Tommy walked, taking the band’s theme song with him. Jimmy continued on with many of the same sidemen as the Brothers’ orchestra, and Tommy formed his own group, basically taking over the band of Joe Haymes. By this time, due to the popularity of his theme song, he became known as “The Sentimental Gentleman of Swing,” the sobriquet he would have for the rest of his life. Even though the brothers would reunite in the 1950s, the pair used Tommy’s theme song. “I’m Getting Sentimental over You” is undoubtedly the best-known composition of George Bassman, whose career was mostly as an arranger and writer for films. Lyricist Ned Washington had many hits, including “I Don’t Stand a Ghost of Chance with You” and “My Foolish Heart” (both with Victor Young), yet he also became heavily involved with film work. Nevertheless, Dorsey’s premier version from 1932 has a vocal by Jean Bowes, and the 1934 version features soon-to-be-bandleader Bob Crosby (Bing’s brother). The song has two refrains, both explaining why a newly-found love is making one feel sentimental. This section suggests definitive or otherwise significant recordings that will help jazz students get acquainted with “I'm Getting Sentimental Over You.” These recordings have been selected from the Jazz History and CD Recommendations sections. 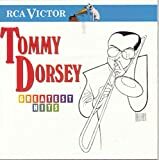 A soaring, lyrical melody with a very wide range (an octave and a tri-tone, or #11) with some wide intervals (up to a seventh), it is not surprising that a virtuoso like Dorsey would choose this piece in order to display his range. Between the range, intervals and its very slow tempo (ca. 55b.p.m. ), this piece is usually better suited for the instrumentalist than the vocalist, but a highly trained, experienced singer could make this a real showpiece. Harmonically the progression of “A” bears a superficial similarity to that of “Heartaches” and “Whispering.” It descends chromatically from the tonic. This piece uses a relative minor substitution with a flatted fifth for the bVII chord and returns to the tonic via the circle of fifths using major tonality. Ebullient trumpeter Roy Eldridge’s 1939 version of Tommy Dorsey’s theme song is one of the few early jazz recordings of the tune. Roy is in top form, and it’s a shame that there’s a so-so vocal instead of more great trumpet. Tenor saxophonist Stan Getz recorded one of the first faster tempo versions of the tune in 1951 while in Sweden. He’s accompanied by a fine rhythm section of Swedish musicians. A swinging session from 1955 features trumpeter Jack Sheldon on one of his first sessions as a leader. Tenor saxophonist Zoot Sims adds immensely to the proceedings and the pair make a great front line. A nice ballad version from 1957 is the duet of bluesy alto saxophonist Lou Donaldson and organist Jimmy Smith. Although it would seem that such a duo would be lacking something, the two produce an incredibly full sound. Drummer Haynes guides the group through a classic bop rendition of the song, high in energy and featuring strong play from saxophonist Frank Stozier and a bruising solo by the leader himself. The novelty of bass player Mingus at the piano is soon forgotten as the listener is treated to an elemental interpretation of the song, stunningly beautiful in its simplicity and refinement. Tight, original and exquisite, this dialogue between pianist Evans and guitarist Hall progresses at an unhurried pace and is tinted subtly with a blues swathe. No one can deliver a ballad any better than Sloane with her smoky voice and almost conversational phrasing. She even sings the seldom-heard verse to this song. The subtlety and sparsity of accompaniment makes this a warm, personal statement. There’s nothing at all sentimental about alto saxophonist Woods’ take on this song. It’s a bop burner from start to finish.